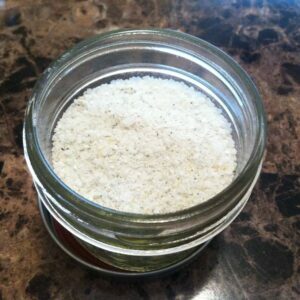 This is a delicious twist on regular salt, perfect on vegetables or as a gift! 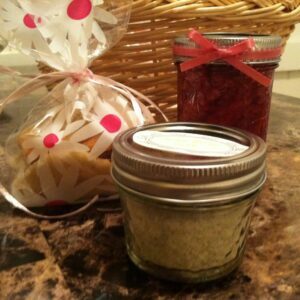 I made some gift baskets last month containing my lavender cookies, strawberry jam, and this lemon parsley salt. Play with whatever citrus you have available, make a few or make just one. I made a few different varieties: meyer lemon, lime, clementines. However, the lemon parsley one is my favorite. Try it on a fresh tomatoes and corn this summer. Perfection! Preheat your oven to 180 degrees. Zest your citrus to get 2 1/2 tbsp. zest. Reserve the lemon juice for later use. If you’re not using it right away, freeze the juice in an ice cube tray. Place the zest onto a piece of parchment paper lying on a baking sheet. Spread the zest so it’s in as even a layer as possible. Dry the zest in the oven for ~45-55 minutes, until there is no more moisture left in the zest. You don’t want to burn it, but you want it to be dry. Remove from oven and let cool. In a food processor, pulse together the zest, sea salt, and parsley leaves until fine. Place in airtight jars and use however you would use salt. What an easy, great idea. Love it!